Berwick Rangers manager Johnny Harvey has, this morning, released a statement following the exit of Paul Willis and Aaron Murrell. The 36-year-old said: "It has been flagged to me that some supporters are unhappy at the players leaving on deadline day and no apparent replacements coming in." Aaron Murrell left the club by mutual consent, with Paul Willis' contract being terminated in order for him to join League Two title chasers Peterhead. Harvey explained the departure of Willis, saying: "It was well documented last night that Paul had signed with Peterhead. "Paul in my opinion will be more suited to playing with Peterhead than he was with us. "Paul is a luxury we cannot afford, Peterhead will dominate the ball more than we will and the opportunity for him to showcase his talent will be greater. "We need a team who are all committed to working for each other and from this point on there can be no excuse for anyone in my team to be outworked by the player they are up against on the opposite team." The Berwick boss then added that he had worked to get players in before allowing players to leave. 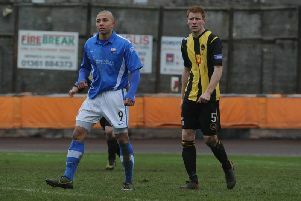 Ahmed Aloulou joined Callum Adamson in joining the club in the last two weeks. "Over the last 10 days we have brought in Callum Adamson and Ahmed Aloulou. These two players fill me with great hope for the remainder of the season. "Both bring pace, power and have an eye for goal. Having signed both these players it then gave me the opportunity to allow Aaron and Paul to move on. Both are talented footballers and I’d like to wish them well in their future football careers." Harvey added that attempts were made to sign defenders but, despite the board freeing up funds, two transfer targets opted to move to League One clubs. 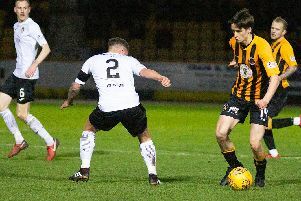 Berwick will not be in action this weekend with the League Two clash with Annan Athletic a victim of poor weather. The statement in full can be viewed here.